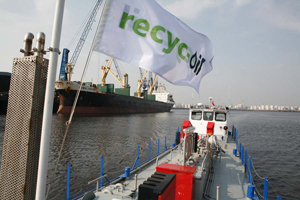 Independent waste management group CSG has acquired Middlesbrough-based waste oil recycling company Recyc-Oil Ltd. It is the Fareham-based group’s sixth business take-over in three years and reflects CSG’s ambition to boost its position in the oil recovery sector in which it has invested heavily in company acquisition, site purchase and new technology designed to treat oily liquid wastes for maximum recovery. Recyc-Oil, which has been operating since 1980, processes around eight million litres of oily liquid waste a year, mainly from the marine sector, generating one and a half million litres of Recovered Fuel Oil (RFO). Among the assets taken over by CSG is the waste barge Erimus Star which collects MARPOL Annex I wastes including bilge water and engine sludges from vessels berthed on the River Tees. Recyc-Oil’s Site Manager, Helen Sykes, remains with the business, as well as all other Recyc-Oil employees, which will now operate as CSG Recyc-Oil. The Recyc-Oil facility joins CSG’s two existing waste treatment facilities – CSG Middlesbrough & CSG Wilton – to expand the company’s range of services offered in the North East. CSG Recyc-Oil brings additional oil processing facilities to complement CSG’s existing oil recovery facility at Middlesbrough which has recently undergone a £1million infrastructure upgrade. CSG operate similar specialist oil recovery and aqueous treatment plants at Cadishead, near Manchester, Bristol, Plymouth, Aylesford, Southampton, Coventry and Worcester. Most of the aqueous waste arriving at these sites is an oily water mixture collected by CSG’s specialist tanker fleet from interceptors, tanks and drainage systems at commercial and industrial facilities such as engineering plants and garage forecourts. The company has the capacity to recover some five million litres of oil each year which can be converted into RFO for industrial use. It recently completed construction of a new storage tank at Cadishead capable of holding 800 cubic metres of RFO and boosting oil storage capacity at this site alone to 2,600m3. CSG managing director Neil Richards said Recyc-Oil was a long-established business with an excellent reputation. Its acquisition would strengthen CSG’s growing operations in the North East, allow the company to offer a new specialist marine service and access a new customer base. CSG’s steady march towards growth has seen the company make business acquisitions on an almost yearly basis. The group already owns established waste management brands such as hazardous waste recovery experts Lanstar, print waste management specialists J & G Environmental and Saxon Recycling, Lloyds Environmental, Sealand and Oil Monster. Mr Richards said further possible acquisitions were currently under active consideration. The group, founded over 80 years ago as a one-man business, now employs a 460-strong workforce. It operates from 25 UK sites, many of which are undergoing major infrastructure development to match the company’s rapid expansion into a growing number of specialist sectors as well as fast growth in the services it has traditionally offered.